Alessandra Rigillo likes to collect beer bottle caps and old plumbing fixtures, but she’s no hoarder in need of an intervention. Now based in London, Rigillo transforms what most people would consider junk into spectacular jewelry. Her canny ability to spot the hidden potential of refuse is even reflected in the name of her collection, Every Cloud Has a Silver Lining, which offers funky, rusty bling coupled with precious stones and recycled metals. Rigillo started dabbling in jewelry only in mid-2009, but her pieces were so well-received that she decided to market her line to inspire people to reuse, recycle, and break away from disposable consumerism. The pieces are meant to inspire people to reuse, recycle, and break away from disposable consumerism. Pubs, a local café, friends, and the street provide ample rusty bottle caps for Rigillo, who strings the pieces together with plumbing metal, copper, and brass from a scrap-metal shop in her neighborhood. Anything is fair game, however, including Barbie shoes, vintage chess pieces, and old sewing-machine components that she pairs with tiny precious stones and crystals. 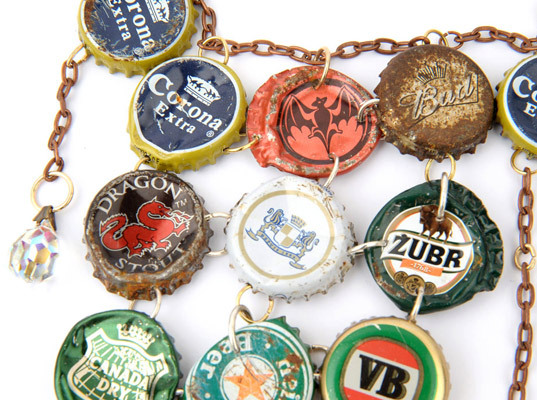 Alessandra Rigillo likes to collect beer bottle caps and old plumbing fixtures, but she's no hoarder in need of an intervention. Now based in London, Rigillo transforms what most people would consider junk into spectacular jewelry. 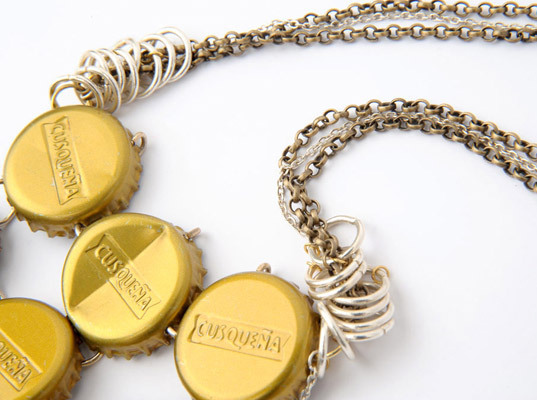 Her canny ability to spot the hidden potential of refuse is even reflected in the name of her collection, Every Cloud Has a Silver Lining, which offers funky, rusty bling coupled with precious stones and recycled metals.